Underwater photography is everywhere these days! It embodies summer so perfectly; it’s playful, adventurous and gives us a whole new perspective on our children. It can also get very expensive, very quickly. Even as a professional photographer, the $1,500.00+ price tag for the underwater housing for my camera was simply not in my budget. Thankfully, there are much more pocketbook friendly options that anyone can try. 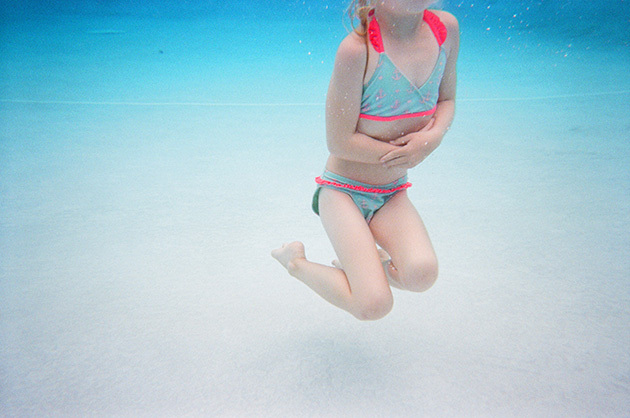 Enter: the trusty old underwater disposable camera. Yes, in this age of iPhones and DSLRs, the disposable film camera from your local convenience store still does serve a purpose. At roughly $8 per camera and with processing from places like mpix.com as low as $0.19 per exposure, you really can’t afford to not give it a try. I made the mistake of waiting until midday during one of my first tries and the pool was filled with people who crowded my shots and made splashes when I didn’t want them. The next time, I went right away when the pool opened at the resort and not only were my shots so much better, but I also didn’t have a ton of other parents staring at me wondering what the heck I was doing. This one might seem like a given but I tried my first few shots just sitting on the edge of the pool and sticking my camera down into the water. It didn’t work at all so into the water I went and it made a world of difference. I had no idea how distracting it would be to have water getting in my nose while trying to compose a shot, so I switched to pinching my nose closed with one hand and holding the camera with the other. It didn’t leave me an arm to maneuver in the water, which made things a bit tricky. Good snorkeling goggles would be best. The settings on disposable cameras are automatic, so you can’t set it to a faster shutter speed to capture motion like you could with a digital camera. Instead of telling your child to jump in and then quickly dropping yourself down in the water to try and get the shot, tell your child to count to 3 first, get in place and then once you see them entering the water- press click. I tried shooting later in the afternoon and on an overcast day once and the photos were much less vibrant and my daughter was much less interested in staying in the water to play. I don’t know about you, but I get so wrapped up in applying sunscreen and making sure my daughter is safe and reminding her to use her side breaths that I forget to simply live in the moment and have fun. So my last tip, if not the most important tip, is snap some photos… and then put the camera away and just have fun with your child. Summer may be coming to an end for many of us, but that doesn’t mean the memories have to fade. Go out and give it a try- I promise you won’t be disappointed!